After recovering from an excellent AGM, we move on. We will meet on the grass parking area at the Hemel en Aarde village at 07.00 to consolidate transport. The walk is anticipated to last between two and three hours. Bring your own drinks and snacks if you wish. I have been asked to remind everyone that the Berry Farm is a working farm and as such there is machinery and tractors etc. moving round all the time so please take care where you walk. They do not sell any products to the general public. Here is a personal observation of problems facing our seabirds. This photo taken as we swallows returned by sea on MV Astor from Cape Town last April. Cruising off the coast of Namibia, we were able to photograph this example of fishing line bird snare. A number of very kind committee members and wives of committee members went to a lot of trouble last evening to prepare and present snacks and wine for those who attended the AGM. Please accept the very sincere thanks of the club and committee for what you did. There can be no doubt that our AGM was more about eating and drinking than formalities. Thanks also to those who helped tidy up afterwards. The club extends it’s best wishes to Peter and hopes that he will soon recover from the effects of his fall. It was a most unfortunate way to end the evening! The committee welcomes Shelagh Peterson, who has replaced Mariette Pitlo. Otherwise you have the same old faces as before. We look forward to a good 2018 with lots of interesting birding! Please note that Mariette Pitlo is standing down after having served a year on our committee. Craig will have nomination forms available at the meeting tomorrow evening should anyone wish to make a nomination to replace her. I just know that there are many people lining up to take this position, so be quick when you arrive at the Fernkloof Hall! Members are reminded that the AGM will be held on Wednesday 21 February. 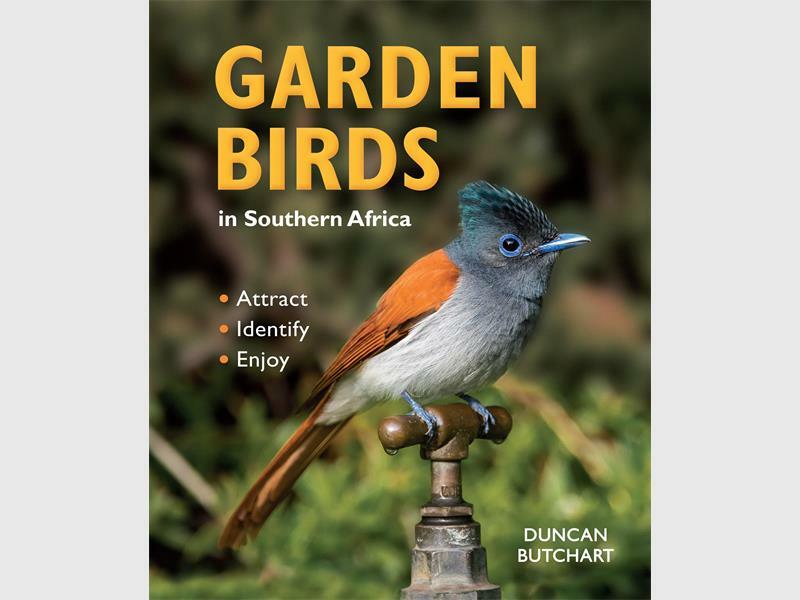 This will follow immediately on a our regular meeting at which Duncan Butchart will speak on Garden Birds and present his book on this subject. Copies of the book will be available for purchase at the reduced price of R200. The meeting will commence at 6:30 pm, and will be followed by an opportunity to socialise over snacks and drinks. Well, the first two months of the Challenge are over and there have been some good sightings by the participants. These include Buff-spotted Flufftail (a very rare bird, seldom seen, but sometimes heard) Eurasian Hobby, Blue-mantled Crested Flycatcher, and a number of rarities, such as Elegant Tern, Blue-cheeked Bee-Eater, Western Yellow Wagtail, White Wagtail, Common Cuckoo and Sand Martin. Needless to say, this has taken many hours of patient searching by some members! Leading the pack is Ronnie Hazell (693 points) followed closely by Lester and Cheryl van Groeningen (612 points) and Ed Meyer (462 points). No doubt the March results will see a closing of the gap between the leaders and the rest of the field as it is becoming increasingly difficult to add new birds, once one has seen the more common ones. One thing is certain and this is that the Challenge stimulates the participants to spend more time searching for birds in the Hermanus area, something that can only improve our local knowledge and add to our life lists. No less than thirty keen birders braved the strong wind this morning to go birding at Rooisand Reserve. As expected the water levels were very low and, with the windy conditions, birds were few and far between, however, we managed to see 47 species, so it wasn’t too bad after all. There was no sign of the White Wagtail, which created such stir a few weeks ago, nor did we see the much anticipated Osprey or Fish Eagle, but there were a couple of Cape Longclaws, and four Great Crested Grebes were spotted on the water. The list included Bar-throated Apalis, Bokmakerie, Cape Bulbul, Common Buzzard, Jackal Buzzard, Cape Canary, Cape Cormorant, White-breasted Cormorant, Namaqua Dove, Cattle Egret, Little Egret, Common Fiscal, Egyptian Goose, Spur-winged Goose, Great Crested Grebe, Common Greenshank, Hartlaub’s Gull, Kelp Gull, Black-headed Heron, Grey Heron, Sacred Ibis, Glossy Ibis, Hadeda Ibis, Pied Kingfisher, Yellow-billed Kite, Cape Longclaw, Brown-throated Martin, Common Ringed Plover, Kittlitz’s Plover, Three-banded Plover, White-fronted Plover, Karoo Prinia, Cape Robin-Chat, African Spoonbill, Cape Spurfowl, Common Starling, Red-winged Starling, Black-winged Stilt, Little Stint, Barn Swallow, Alpine Swift, White-rumped Swift, Cape Teal, Caspian Tern, Cape Turtle-Dove, Cape Wagtail and Common Whimbrel. A few of the participants then stopped at the Hawston sewage ponds on the way home and added Marsh Harrier, Spotted Thick-Knee, Yellow-billed Duck, Intermediate Egret, Black-crowned Night-Heron, Purple Heron, Little Grebe, Common Moorhen, Levaillant’s Cisticola and Lesser Swamp Warbler. A great effort, bringing the total to 57 species!